Complete electric brewing systems from Blichmann Engineering! 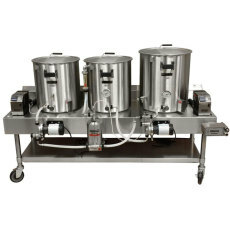 These are turnkey brewing systems that come with everything you need for mashing, boiling, sparging and cooling! Part of their pro series, Blichmann has taken the hassle out of cobbling together a brewing system by including everything you need for brewing except the fermenters! These systems are perfect for home use or as pilot systems for commercial breweries. No fuss, no hassle, just pure brewing power from Blichmann Engineering! A 10 gallon horizontal electric brewing system from Blichmann Engineering! A 15 gallon horizontal electric brewing system from Blichmann Engineering! 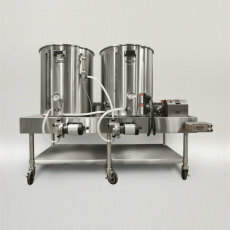 A 20 gallon horizontal electric brewing system from Blichmann Engineering! A 5 gallon horizontal electric brewing system from Blichmann Engineering utilizing their HERMS coil! A 15 gallon horizontal electric brewing system from Blichmann Engineering utilizing their HERMS coil! A 20 gallon horizontal electric brewing system from Blichmann Engineering utilizing their HERMS coil! A 1 BBL horizontal electric brewing system from Blichmann Engineering utilizing their HERMS coil! 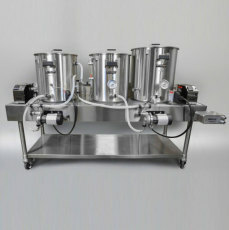 A 5 gallon horizontal electric brewing system from Blichmann Engineering!